First, Jewels in the Crown BOM is doubling up! This month I am posting 2 blocks! I know, its like an end of summer bonus!!! 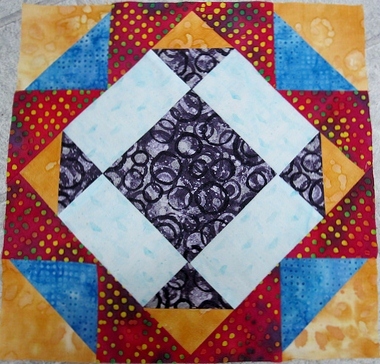 But I want to get all the borders for this quilt in before the end of the year so I needed to double up on a few blocks. GO TO THE BOM PAGE TO DOWNLOAD BLOCKS! Block 8 is Glowing Sceptor and Block 9 is Carnelian and Ruby. Instructions and optional foundation patterns are available FREE for 2 months (August 1 to October 1). 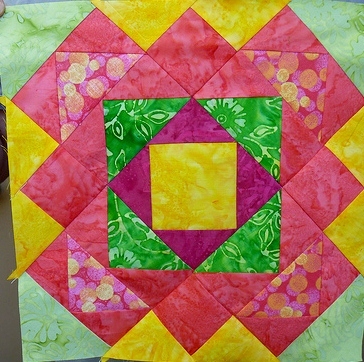 Next, post a picture of your completed blocks 8 and 9 on the JEWELSBOM Flickr site and be entered to win a free patterns and Fat Quarter Pack. I got a little behind on this during the spring, but all the prize packs have now been sent out and I am ready to start up again. May: Swalla2011 is the Winner!!!!! Send me your snail mail address so I can send you your free pattern and Fat Quarter Pack!! June: Sassymisspeanut is the Winner!!!! July: Quiltyjen is the Winner!!!! Congratulations to the summer winners!! 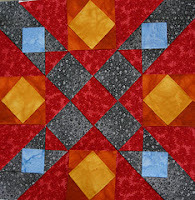 I am just thrilled by the colors you use and the gorgeous blocks you create. Please be sure to post pictures of completed blocks for the 2 August blocks as there will be a DOUBLE PRIZE PACK for the August Winner! I am having my website rebuilt and it is going to be spectacular!! Want a sneak peek?? It will be going live the beginning of next week and I am so excited about it. It will have SOOOO much more functionality, much easier shopping cart, a wholesale site for shops, and a much nicer look. I am learning to use Word Press and working with my web developer to make everything work. Once the final testing is done on it we will go live. To celebrate my new site I am having a BIG contest! Watch for details. There will be some great prizes and entering is easy. Stay tuned for more on this big event. Finally I gotta brag on my web development TEAM! Anne Ashley, the graphic designer is just the best and so great to work with! Thanks to my friend Connie in MA for putting me on to her. She is a treasure! And her buddy Jo Ericson, the web developer, is so talented and amazing. If you are looking to update or develop a new web presence I strongly recommend these two incredible women. Till later. . . . I am overwhelmed! Thank you for picking my block to win for the month of June. I am very excited to find two blocks posted this month. I look forward every month to see the new block. I am doing it all in batiks and I already love this quilt! What a great post! so much fun. Thanks for hosting the giveaways, I'll be sure to send in my address. I am loving how this quilt is coming together and am excited that we hit the double block months! Keep them coming! Thank you!! I received my prize package today in the mail. 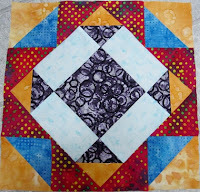 I love the fat quarters and love, love, love the pattern! Thanks so much for a prize that I will use and enjoy!